In the wake of last weekend's killing of one of the world's most famous wolves, Montana has banned wolf hunting near Yellowstone National Park on the eve of the opening of trapping season. She is the eighth Yellowstone wolf killed this year. Read about Montana's ban here. Wolf832F, also known as Wolf 06, for the year she was born, was one of the most popular of the approximately 85 gray wolves living in Yellowstone since the reintroduction of wolves there in the '90s. It took scientists years to collar 06, who was clever enough to hide from helicopters to avoid being captured, said Douglas Smith, a biologist who studied her for several years, in an interview with NPR yesterday. 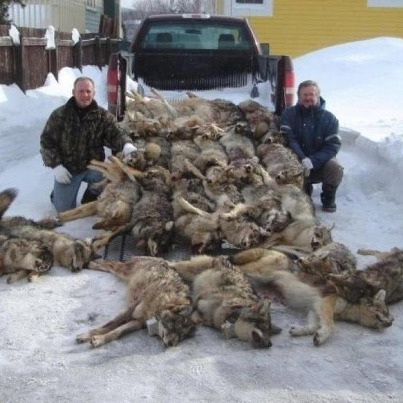 In this interview, Smith concludes that allowing hunters to kill wolves is likely the way forward in the West. Though many more livestock are killed every year from weather and illness related events, ranchers still wish to see wolf populations reduced or eliminated. Wolf hunting seasons may the be the release valve that allows scientists and environmentalists to continue their efforts to reintroduce wolves to much of the West. Listen to that NPR interview here. Though hunting may be the way forward, we feel strongly that limits must be placed on the activities of those who wish to kill wolves. We are particularly sad to learn of the death of this wolf, who was known for her formidable hunting skills (she could take down an elk alone) and for being the leader of her pack despite that she was female. Wolf_06.pdf">Read a study of her behaviors here. See photos of her and her pups here. We continue to hope ranchers and hunters will put the risks that wolves pose to livestock and humans into perspective.